“I’ll never forget looking out of the train watching hundreds of wild horses running across the plain.” Roger’s eyes get a far-away look as, in memory, he sees those magnificent, free horses. In 1994 Roger was on a journey. He’d left his home in Valemount, B.C., Canada to travel by train from Beijing, China, through Mongolia and Siberia, then across Russia to Moscow. He wasn’t traveling on the famous Trans-Siberian Express. His trip was on the little-known but far more important Mongolian Trader Train. On this train Mongolian traders brought Chinese goods to the people of Siberia and Russia’s other Eastern holdings. So far it had been interesting. Roger and his back- pack had navigated both the Beijing airport and train station. There was a twelve hour delay at the Mongolian/Chinese border while workers changed the entire undercarriage of the train. The rail gauges are different on each side of the border to prevent invasion of China by rail. Now, on the dusty railway station platform in Ulan Bator, Mongolia’s capital, Roger thought about those horses. He decided there’d be another train along later. He was going to spend some time in Mongolia. In 1994 the Russian empire had started to crumble. The Russians, to most Mongolian’s great delight, had left Mongolia.. There were no Westerners in the country, except for a few U.N. staff in Ulan Bator. A Mongolian man heard Roger talking English at the train station. He came over and introduced himself. He was a structural engineer, educated in Czechoslovakia. “Where are you staying? What do you want to do?” he asked Roger. 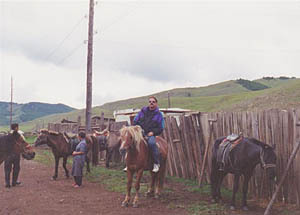 “What I really want to do is get out of Ulan Bator, go some place up in the mountains, and ride horses.” Roger told him. Easily done. The Mongolian fellow said his family had a little guest place at their sheep camp in the mountains. He’d line Roger up with them. The next thing Roger knew he and some others were on a flatbed truck usually used to haul livestock, headed for the mountains. It took forever to get there on the narrow dirt roads. The village, when he arrived there, was more of a traditional sheep camp than a resort. 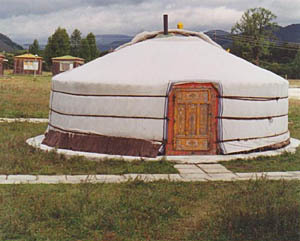 The guest ger, (yurt is a Turkish word for these tents, ger is the Mongolian term), was built like all the others with a high floor, cross pieces underneath so there was good air flow. There were beds and a wood stove. It was very comfortable, if a bit smoky. These horses and their riders are descendants of the Mongolian cavalry which, beginning in 1210, swept out from their homeland to eventually conquer Central Asia, Northern Iran, China, Afghanistan, Georgia, Bulgaria, Kiev, and Moscow. They had defeated several Hungarian armies and were knocking on the doors of Vienna when word came that their leader had died and they returned home to select a new ruler. They never forgot their homeland. Stories go that Genghis Khan’s victorious armies were happy to return home from China to their high, cool pastures and nomadic life. Fourteen years later the kindness and hospitality of the Mongolian people are what Roger remembers most. When he first came to the camp he was welcomed by the engineer’s mother and extended family. It was the mother to whom he paid rent for the guest ger. This woman had been born and spent all her life in her family tent, out on the plains. front of her ger, she proudly dressed up in her best clothes. The family treated Roger more as an honoured guest than a tourist. He was invited into their ger and given a drink of fermented mare’s milk in an old silver bowl. It’s very important that the guest drink the whole bowl of milk. He also had time to mail a post card home to his son in Salmon Arm. The post office was an old shed. The post card got there, though. Then it was back on the trader train headed for Siberia. Roger and an Englishman were the only non-Mongolians on the entire train, except for the Russian guards. Roger’s two weeks in Mongolia and his cross-continent trip on the train with them, gave him a deep respect and admiration for these people, trying to keep their traditions alive against powerful forces. Sadly, it’s uncertain if they can succeed. In the 1990’s the Han Chinese brought twenty-five million goats into Mongolia, to provide cheap Chinese cashmere for the international market. Mongolian nomads always rotated their herds of cattle, horses, sheep, camels and goats through different pastures. Intense over-grazing by the Chinese goats had a devastating effect on grasslands. Desertification became a concern to the government. Although much of it was caused by the recently arrived cashmere goat farmers the Chinese government blamed traditional Mongolian herders. 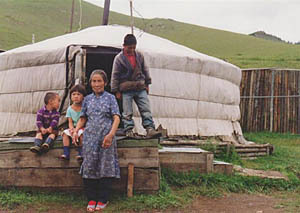 In 2002 that government officially ended the Mongolian’s way of life. It uprooted them from their ancestral lands, confiscated their herds, and forced them from their gers into small, crowded houses in instant towns. They’ve lost their freedom and their culture. No longer can they pack their gers and travel with their herds to fresh, green pastures. Nor can they kill an animal to welcome guests with fresh meat. 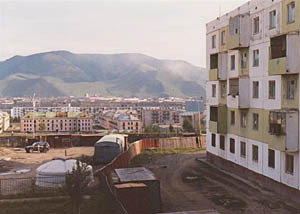 Since 2001 more than 800,000 Mongolians have been relocated. A self-sufficient lifestyle that lasted for two thousand years seems doomed. Roger was fortunate to have seen those great herds and gotten to know those good people.